Nowadays each country can be threatened by terrorism. 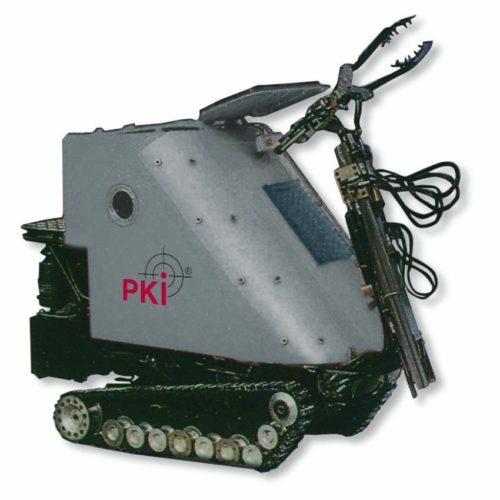 Therefore it is essential to have all necessary basic equipment available such as our PKI 7560 obstacle-clearing tank. German experts for explosives are the no. 1 worldwide due to their long lasting experience of bomb disposal. As specialists often don’t like to work via monitor, this unit has been developed. The driver sits in a shell of 6 mm Naxtra steel, which resists explosives of 5 kg Nitropenta. The front side is especially reinforced with a 33 mm thick Lexar disc. You get inside the obstacle-clearing tank through a hatch which can be opened from in- and outside. An optional installation of 2 oxygen bottles guarantees survival in case of accidental burying. Its small width of only 75 cm allows operation in confined areas.